The Rotational Motion Lab helps students investigate the relationship between angular and linear velocity. A DC-driven motor produces various rotational velocity at various distances from the motor. Different radii are drawn on the disk, and pegs can be positioned at specific radii. A photogate can be attached as well, so the time of one rotation is easily measured. Students make measurements to calculate the angular velocity, which is constant for a given motor speed independent of position. However, the tangential velocity varies based on the radius of the circular path. 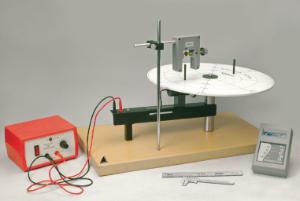 Ordering information: This kit includes a rotational table, ruler, and calipers. A 6V power supply and a photogate system is required but not included.